Liverpool's new container terminal expects to ramp up transatlantic shipping as British companies look to deepen business ties despite concerns that the U.S. election of Donald Trump could hinder free trade, the port operator's chief said. Private group Peel Ports has invested 400 million pounds ($510 million) in transforming Liverpool's existing facility into a deep-water container terminal that can receive bigger ships. The new development opened last month. 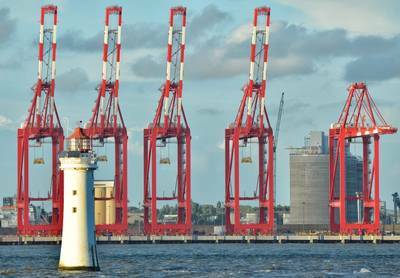 Mark Whitworth, chief executive of Peel Ports, said Liverpool, on England's northwest coast, already had 45 percent of the UK's transatlantic trade and "there is no reason why our aspiration should not exceed 60 percent". A number of companies have made investments in the region, including spirits giant Diageo and car maker Jaguar Land Rover - both of which were targeting bigger transatlantic trade, Whitworth said. Britain's decision to leave the European Union is also driving efforts to bolster trade outside the bloc. At the same time, there have been worries about Trump's presidential campaign pledges on redrawing trade deals to win back U.S. jobs. Economists have warned such moves could spark a trade war and roll back decades of liberalisation, which has buoyed international shipping. "I genuinely believe that Brexit in conjunction with the U.S. presidency will force greater trade between us and the U.S.," Whitworth said, dismissing trade concerns over the election of Trump. "Liverpool particularly is extremely well placed to capitalise," he told Reuters. Whitworth said Liverpool port was also looking at closer ties with the Panama Canal and had signed a memorandum of understanding in recent weeks aiming to bolster trade with South America. The expanded canal opened in June, fitted with new locks that allow ships three times bigger than previously to pass through. The container sector continues to struggle with weak earnings due to softer consumer demand and oversupply, which has triggered a wave of mergers and acquisitions. The world's top container group, Maersk Line, said last week it would buy smaller rival Hamburg Sud. Whitworth said Peel Ports expected more consolidation next year, which would enable lines to become more innovative on trade routes including via the Panama Canal. Peel Ports, Britain's second-biggest operator in terms of cargo handled, competes with bigger private rival Associated British Ports (ABP). When contacted, ABP said Liverpool, like its own ports in the northeast Humber region, was "an important gateway" for Britain's north. "Investment in new port infrastructure and facilities is vital to ensure businesses up and down Britain benefit from the best possible access to international markets," ABP said.